My friend Chip is that guy who always wears’70s-style terrycloth stretch wristbands. (They look very butch on him, I might add.) It becomes complicated, though, when he wants to wear the band AND a watch. His problem, and perhaps yours, is now solved. 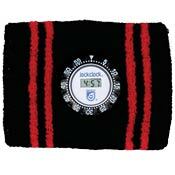 This is a “Jockclock.” You heard me correctly—it is a combination wristband and clock, in your choice of analog or digital, on a plain or striped design. How can anyone possibly resist this item, especially at the price—a mere $14.95. Their website is jockclock.com and they do not currently have e-commerce—you have to email them at 411@jockclock.com. It’s worth the work to score a cool accessory in time for the sweaty summer season.